In this modern world we sometimes forget to switch off, sit back and listen to the radio – All That Fall, an audio play by Samuel Beckett forces the senses to light up with imagination, filled with images that you cannot see. Beckett, one of Ireland’s finest writers, investigated the mystical power of radio plays from 1956 to 1963. And interestingly in this age of steadying impatience, with people demanding gratification right now – The Abbey Theatre has encapsulated a period almost lost, which we should grab on to with both hands. I have to admit, the sound of a play without actors on a stage did not enthrall me – but I wanted to give a radio play a shot because surely the idea was novel, at least. But what Pan Pan Theatre have created with this performance is something quite brilliant. Even more brilliant, was the fact that I swear I spotted Michael Gambon, the voice behind one half of a miserable and aging couple in the radio play, in a bar just before the 9pm show. The actor who played Dumbledore – the beloved wizarding headmaster in the later Harry Potter movies – was enjoying a drink opposite the theatre on Friday night. Once I kicked myself back to reality and left the bar, and the man I believe to be Mr Gambon, behind, to watch the women’s rugby, I joined the audience at The Abbey as we were escorted in to a secret room, beyond the stage. The modestly sized hidden corner of the vast theatre, was lit up with bulbs hanging from the ceiling. 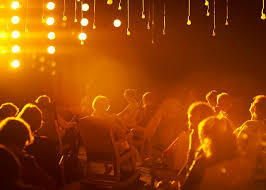 Throughout the audio play, these would light up or suddenly dim, along with larger stage lights, attached to a wall in front of the audience. 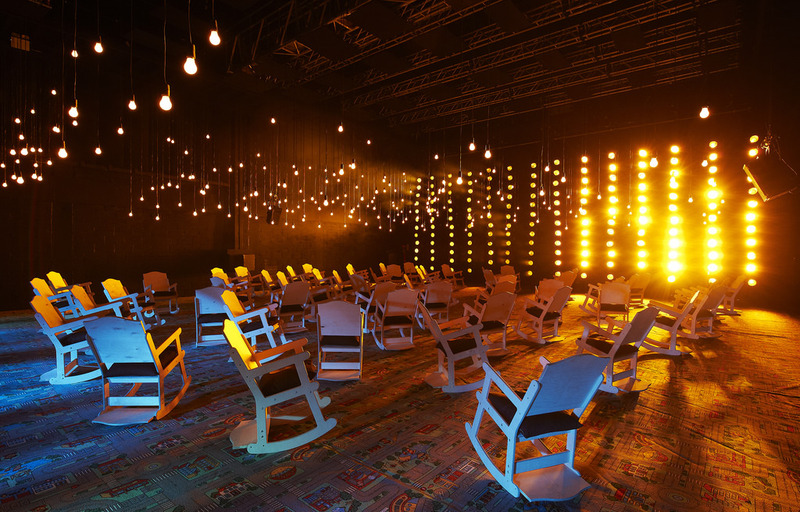 Rocking chairs were scattered across the room for the audience to enjoy the relaxation that an audio performance could provide. All That Fall is the story of a lonely, elderly woman Maddy Rooney, who seems to have fallen in to old age and simultaneously lost the love of her husband, Dan. Though they are together in life, it seems that they are, like many couples, far apart. And though she yearns for two signs of affection, mere pecks on the cheek in the morning and before bed, even these seemingly small requests are too much to ask. The opening scene finds Maddy struggling down a country road towards the station, named Boghill in the play. It’s her husband’s birthday. She’s already presented him a with a tie but decides to surprise him by meeting him off the 12:30 train. At each stage of the journey, she meets a number of people, including an old admirer. He offers her a lift in his limousine but she is too plump to enter the car with ease. Comedy ensues as grunts and pants emerge from the huge, great speakers, hidden somewhere in the room. The couple sound almost as if they are up to some type of nocturnal activities not becoming of a married woman in those times, or today of course. But the grunts are nothing more than a struggle to help Maddy gain entry to the car. She finally makes it to the end of the journey to find the train her husband has been on is delayed – something that never occurs at the station. It seems Beckett’s Ireland is far removed from the Ireland of today where such delays would be no surprise. Moments later the train arrives and the huge lights at the front of the room illuminate to such an extent that warmth can be felt on the audience’s faces. The crescendo of the huge steam train chugging in to the station can be heard loudly, almost too loudly – to the extent that listeners could easily be sitting right in front of the steel monster. And we hear Maddy as she panics when she can’t find Dan, who has been led to the toilet by a young boy, Jerry, whom often helps him for a penny. Jerry refuses to discuss why the train was late and the couple begin their trek by foot home, moaning and sighing with every step. As the couple continue their arduous walk home, sheep and cattle can be heard, children poking fun at them and finally a terrible storm, that we can only presume must have soaked and blown them off their path. Jerry, the young helper, runs after Dan, informing him he had dropped something. Maddy enquires from the innocent child, who is sure to tell all, just why the train was late. The answer ends the play with a shock, as we think of the tragic consequences of what could result from a simple journey on a train. The delay could explain Dan’s mood but we are left with the impression his passion for love and life, has left his body before his last breath. Jerry exits and we hear his steps fade away and the couple head off in silence as we contemplate the awfulness of what has occurred. 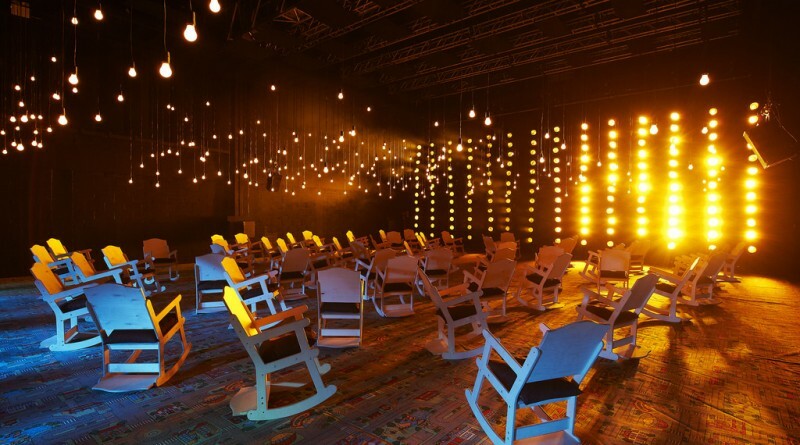 On the night I attended the performance – half play, half art installation – it took the audience moments which seemed to turn in to minutes, to realise the event had come to an end. After all there was no sign of an ending without a lack of bodies exiting the stage. Theatre goers stretched from their rocking chairs and looked round, eyes blinking, to others, to see was this really the end. It was and only then did I notice the cushions on the rocking chairs bore black skulls. The designs had clearly added to the deathly, sinister subject matter at the heart of the play. My mind wandered as I left the theatre a little dazed. I forgot to see if Mr Gambon was still watching the rugby. All That Fall is at the Abbey until February 20th.